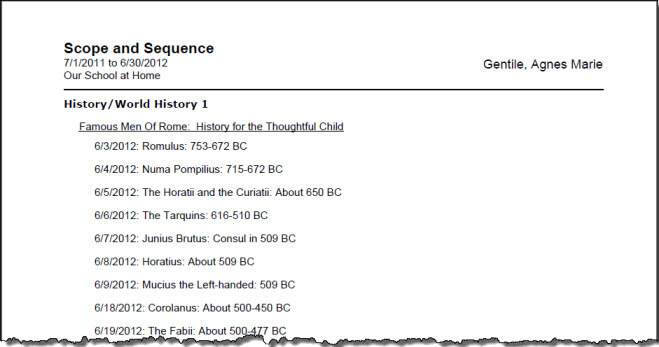 In the Assignment version of this report, you can print out the Topics for one or more Subject/Course selections. If you display the Assignment date, the Topics will appear in date order. If you hide the Assignment date, Topics appear in alphabetical order. Select a date range for the report. Enter a date using the mm/dd/yyyy format or click the Calendar icon to select a date. Incomplete Assignments: Topics tied to any Assignment which has no checkmark in the Complete: Teacher box and falls within the selected date range will be included in the report. 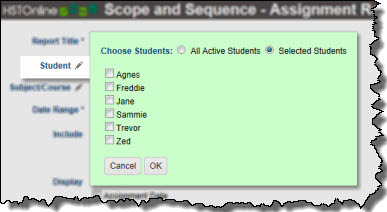 Complete Assignments: Topics tied to any Assignment which has a checkmark in the Complete: Teacher box and falls within the selected date range will be included in the report. 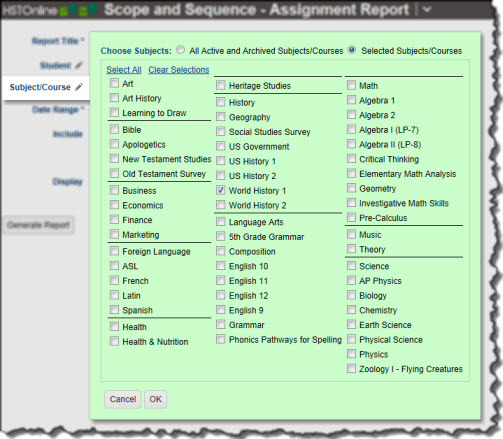 Resource Name: Within each Subject/Course, Topics will be grouped under the Resource which is tied to that Assignment. Resources appear alphabetically. Topics tied to Assignments with no specified Resource will appear first. Assignment Date: If you display the Assignment date, the Topics will appear in date order. If you hide the Assignment date, Topics appear in alphabetical order. 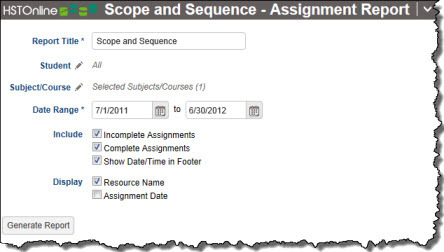 On the HSTOnline menu, click or touch 'Scope and Sequence - Assignments' under the 'Reports' section.